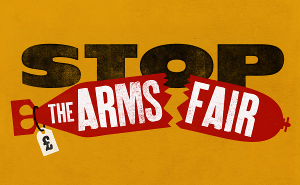 On Tuesday 5th September, faith groups of all kinds will come together for a day of worshipful and peaceful nonviolent resistance and prayer to say no to the arms trade and no to profiteering from war. In the morning, Wake Up London will lead a Peace Sit meditation followed by a Quaker Meeting for Worship and readings from the Torah. An international prayer for peace will be followed by a bring-and-share picnic. In the afternoon, speakers will be exploring the relationship between faith and militarism and the effects of militarism on different faith groups followed by songs of peace from the Anglican Pacifist Fellowship and a liturgy from Pax Christi. There will be street theatre taking place throughout the day: ‘The Terrible Marriage of Britannia and Death’! 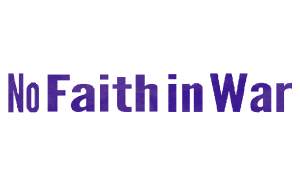 Together we will be present to bear witness and say ‘no faith in war’. The provisional timetable can be found here. There is still plenty of room for more faith groups to become involved. Please get in touch at nofaithinwar@stopthearmsfair.org.uk to find out how. Alternatively, you can just turn up and join us on the day! Where? 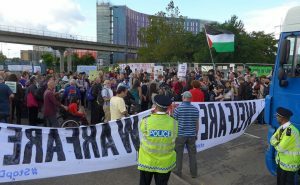 Outside the ExCel Centre at the eastern end. The ExCel Centre is on the Docklands Light Railway (DLR) and the nearest station is Prince Regent. What should I bring? Prayers, music, food, water, your mates, weather-appropriate clothing – come ready for a full day outside. If you want to you can bring prayer flags and symbols of your faith to decorate our interfaith prayer space and food to share at the bring-and-share picnic (please consider the religious and other dietary requirements of the other picnickers if at all possible). And, of course, your placards and banners. Transport is being arranged from Leeds, please contact nofaithinwar@stopthearmsfair.org.uk if you would like to join us on our minibus. And don’t forget to join and share our Facebook event and help to spread the word! 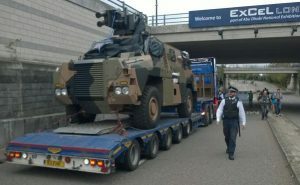 Today’s faith-based day of action, ‘No Faith in War’, saw both entrances to the ExCeL Centre blocked for nearly four hours and several armoured vehicles turned away!